On December 1st the LCWA hosted the first of its School of Languages, Cultures, and World Affairs Colloquia Series. 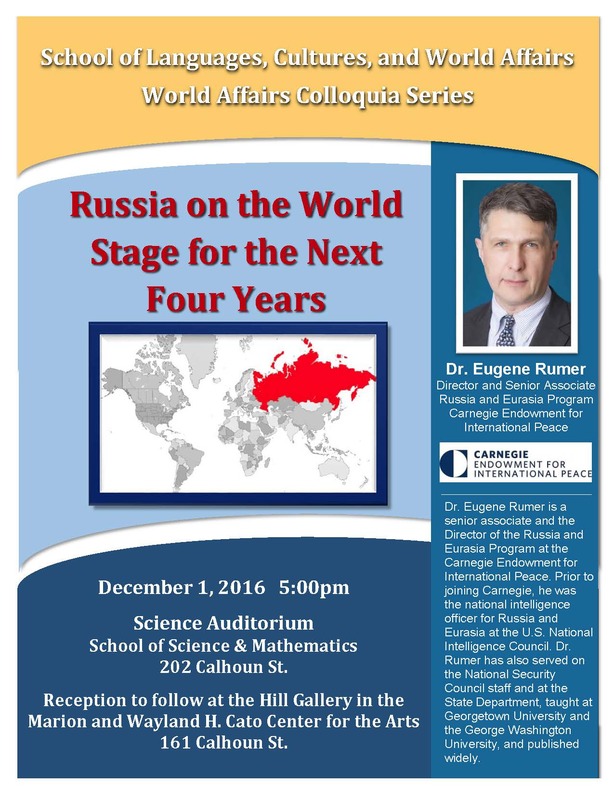 Dr. Eugene Rumer, the Director of the Russia and Eurasia Program at the Carnegie Endowment for International Peace, presented his thought-provoking talk, “Russia on the World Stage for the Next Four Years” to a full auditorium. 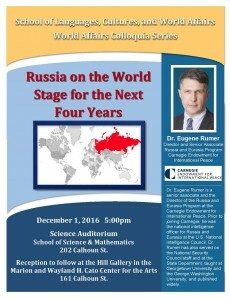 Dr. Rumer discussed Russia’s foreign policy, its position on the world stage and the possible shape of US-Russian relations over the next four years. The Science Auditorium in the School of Science & Mathematics was packed full of students, faculty, staff and members of the community eager to hear Dr. Rumer’s lecture. Congratulations to Professor Jim Newhard. His book chapter “A survey of chipped stone resources and production in the Argolid” has been published in Lithics Past and Present: Perspectives on Chipped Stone Studies in Greece (Studies in Mediterranean Archaeology 144) 141-158. “The mission of the Society for Classical Studies is “to advance knowledge, understanding, and appreciation of the ancient Greek and Roman world and its enduring value.” That world was a complex place, with a vast diversity of peoples, languages, religions, and cultures spread over three continents, as full of contention and difference as our world is today. Greek and Roman culture was shared and shaped for their own purposes by people living from India to Britain and from Germany to Ethiopia. Its medieval and modern influence is wider still. Classical Studies today belongs to all of humanity. 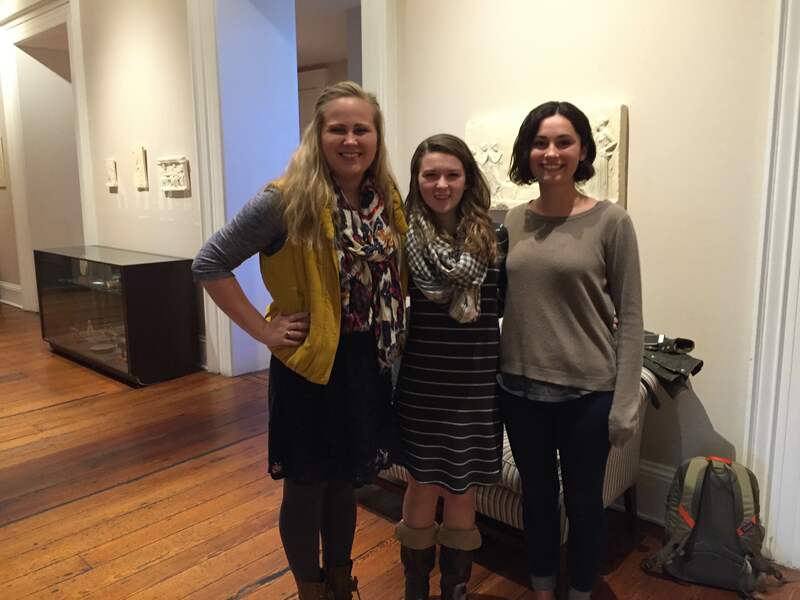 Congratulations to Sarah Cohen, Hannah Edwards, and Gwen Gibbons, who were chosen to present their research at the Undergraduate Classics Conference, sponsored by the Department of Classics at the University of Tennessee (Feb. 25, 2017). Congratulations to Hanna, Gwen, and Sarah (left to right), and all our student researchers! 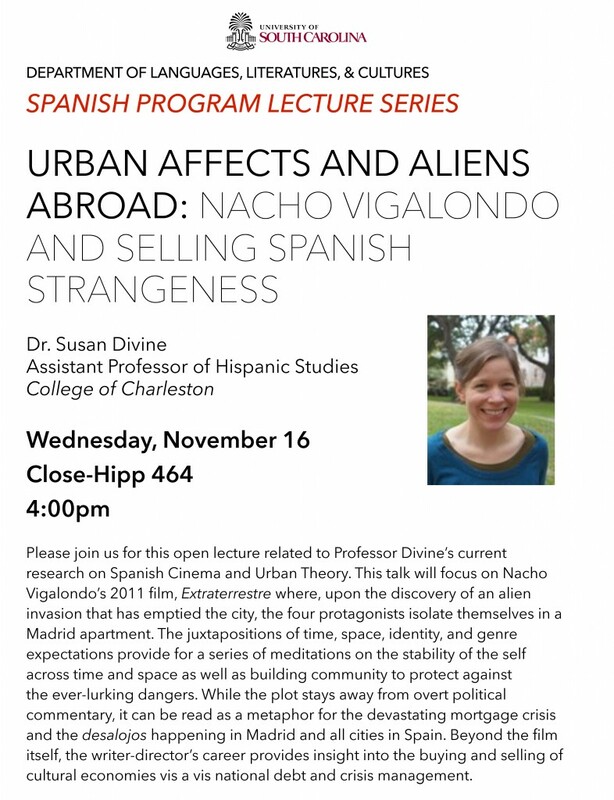 At the Midwest Modern Language Association’s 58th Annual Convention on November 10-13 in St. Louis, Missouri, Professor Susan Divine presented her paper “Javier Olivares from La luna de Madrid to El ministerio del tiempo.” Click here for full conference program. In the wake of the mistrial declaration on Monday in the murder case against former North Charleston police officer Michael Slager, we reprint below a letter that African American Studies-affiliated faculty at the College of Charleston sent to the editor of the Charleston Post and Courier expressing our concern that local newspaper coverage of the trial stirred too many echoes of prior narratives in which murderous violence against African Americans went unpunished. Eighteen months after his arrest, former North Charleston police officer Michael Slager is now on trial for the murder of Walter Scott, a black man shot to death after a routine traffic-stop. Although the police department and SLED initially concluded the shooting was justified, a bystander’s video of the shooting led to Mr. Slager’s arrest for murder. We all have become witnesses to Mr Slager firing repeatedly into the back of the fleeing Mr Scott. As Mr. Slager’s trial unfolds, we watch with concern and sadness, knowing that the North Charleston shooting is one in a horrific series of recent police killings of unarmed African Americans. The recent P&C headline, “Was Slager justified or overreacting?” stirs echoes of too many prior narratives that blame the victim—who should not have run, should not have talked back, should not have somehow looked threatening. These historical facts are a few of many examples we might cite. More recently, statistics collected by our own law enforcement agencies have shown that a much higher percentage of our citizens of color are being stopped by police, just as Mr. Scott was, for traffic violations. Mr. Slager’s attorney has noted the police department’s quota of three traffic stops per shift. A local interracial organization, the Charleston Area Justice Ministry, has collected accounts of many of its members of color who have been stopped, and has joined the NAACP and the ACLU in calling for a public and independent audit of police practices in Charleston County, North Charleston, and Charleston. Even the North Charleston City Council has now voted to create a “Citizen’s Advisory Commission on Community-Police Relations.” However, many in our community are concerned that this gesture will not guarantee greater transparency or accountability in the city’s police practices. Our academic expertise compels us to conclude that concerns about the Slager trial are thoroughly and sadly justified, and that the systemic problems this case has exposed will not be solved when the trial is over. We urge our fellow citizens and our elected officials to listen to the concerns being voiced and to take actions that will contribute to greater justice and safety for all residents of our communities. At moments over the last week, it looked as if the pattern of prior narratives of impunity might finally—historically—be disrupted, but with the news on Monday afternoon that the jury was deadlocked and that a mistrial had therefore been declared, we have once more seen a deferral of justice. Prosecutor Scarlett Wilson has said that she will retry the case, and there is still a federal case open against Mr Slager for depriving Mr Scott of his civil rights, but the failure of this jury to reach a consensus verdict is, as Ms Wilson commented, profoundly disappointing. We in the African American Studies program will continue to watch as this case unfolds further. It is worth remarking that our letter prompted at least two responses published subsequently in the Post and Courier, taking us to task for being a “group of liberal professors” making armchair decisions. We had in fact deliberately drawn attention to our status as people with academic expertise in African American and Southern studies and had deliberately limited the number of people invited to co-sign the letter to professors with such expertise in order to offset just such a knee-jerk response. Racial injustice is not—or should not be—a partisan concern. The fact that it might have been so in the 1870s, 1920s, or 1950s when white supremacy was sometimes explicitly, always tacitly backed by law is part of the historical record. Our fervent hope was—and remains—that one day it will be only a part of that historical record, not a factor in contemporary life, and that one day, finally, this nation will live up to its ideals of providing liberty and justice for all. Two courts in the city of Charleston are currently overseeing high-profile, racially charged murder trials–that of Michael Slager and Dylann Roof–and although the cases differ in their particulars, both of these crimes speak to the pervasiveness of white supremacy locally and nationally. In an interview with Brandon Patterson, a reporter with the nonprofit news organization Mother Jones, Professor Mari N. Crabtree discusses the meaning and significance of the Slager and Roof trials. She also cautions against complacency in the wake of the verdicts, for the best memorial that Charlestonians could erect for the victims is not carved into granite but forged out of a serious confrontation with the systemic issues that produced these heinous acts of racial violence in the first place.